No additional firmware (e.g., EMA firmware) is required. ...may be used to copy the included image to the drive with the "dup" command. capacity. The drive must be set to respond on HP-IB address 0.
the PC; refer to the section titled "Configuring for the HP 1000" for details. identical to that when using a real drive. A Windows version of "dd" is available; download the GNU Coreutils "bin"
The FEM is typically found in E/F-Series systems, although it is not required. empty slots between I/O cards; this restriction is not present under SIMH). will be required, as RTE only accepts commands in uppercase. 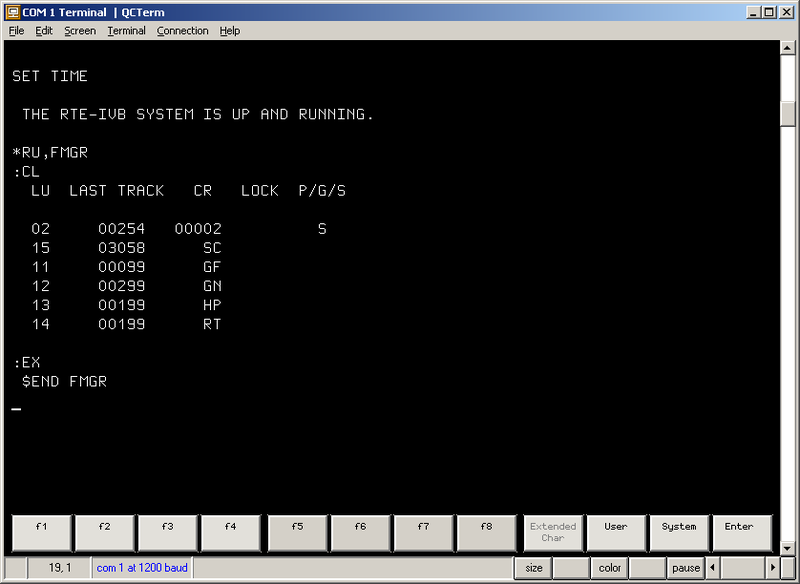 The system is configured for two 7920H drives, although only one is required. the system disc configuration to permit interchange mounting. The FMP master security code is RT. in the years, e.g., "19:0" for 2000.
by FMGR, LOGON, LOADR, et. al. FTIME. Used by ASMB, XREF, FTN4, et. al. form "790524.1452". Used by EDIT. Returns the time of day in either of the forms "Thu May 24, 1979 12:52 pm"
or "790524.1452". Used by the Pascal compiler and Pascal programs. "2305 06AUG76". Used by READR and SAVER. The $BALC module in the system library has a bug that causes memory corruption. gibberish after the PLEASE LOG ON: prompt. The manuals can be found here.